The Vanity Trove of July 2013 came packed with beautiful surprises, with the theme 'Midsummer Gala'. The products with this theme are meant to rejuvenate the heat-exhausted skin in the mid of summer season. The trove comes with a fashion & beauty journal Vanity, which gives detailed information about the products to be included in the trove every month and also has some offers and discount coupons. The brands selected for July's Midsummer Gala were VICHY NORMADERM, NEUTROGENA, JANE IREDALE, PHYSIOGEL, HERBORIST, D'GLAMOURIC, SKIN INC and AVANCE. 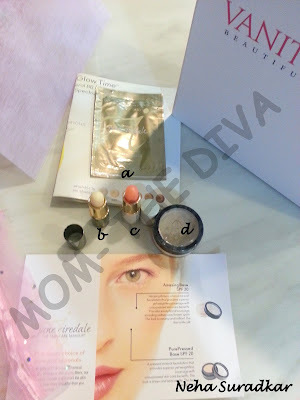 I received a lot of products in July Trove and let me tell you all about them. 1. Physiogel Cleanser, 60ml (Retail Price- S$18.90 for 500ml) is a soap free cleanser suitable for all skin types and the best part is that it can be used with or without water. It helps in maintaining the skin's moisture balance. When used with and without water, it did not cause dryness. It can be used on face and body. It can also be used for babies (printed on the cover). Value of sample- S$2.27. 2. Physiogel Cleanser, Lotion and Cream Sachets, 10ml, 10ml and 3ml (Retail Price: Cleanser- S$18.90 for 500ml, Lotion- S$33.90 for 200ml, Cream- S$22.85 for 75ml) The lotion helps in skin repair and hydration. This can also be used for the face and body. The Cream contains natural lipids, similar to those in the skin and revitalize and protect the dry skin. The samples could not be tried yet because of the sachets (This is why I don't like Sample Sachets!) Value of Samples: Cleanser- S$0.38, Lotion- S$1.75, Cream- S$0.91. 3. SKIN INC Repair Pcynogenol Serum, 30ml (Retail Price- S$169 for 30ml)- In the June Vanity Trove, I received SKIN INC Regenerate Vitamin A Serum (which I am currently using and loving it!) and this time, out of the two products selected for the trove I got Repair Pcynogenol Serum containing anti-oxidants that helps in moisturizing skin and combating ageing. It has beady texture and when tried, the serum leaves the skin moisturized and soft. I think I am already falling in love with this serum. The other product was SKINC Regulate Vitamin C Serum, which helps in minimizing the pores and outbreak of pimples. The selection of product for my trove shows the personalization of trove where I mentioned in my beauty profile that I have no pimples or any other skin inflammation. Jane Iredale is a line of Mineral makeup. These products underwent a rigorous set of sensitivity and safety tests and are recommended by skincare professionals, plastic surgeons and dermatologists. a. Glow Time Full Coverage Mineral BB Cream, 2ml sachet (Retail Price- S$78 for 50ml). A multifunction cream act as foundation, concealer, sunscreen and moisturizer. Looks promising but was not able to try due to sachet. It is available in 6 shades and you can select one that matches your skin tone. Value of sample- S$3.12. b. Lip Drink (Retail Price- S$21). It is a natural, sun blocking lip balm, with citrus flavour and mixture of lemon and orange oils. c. Just Kissed Lip & Cheek Stain in Forever Pink (Retail Price- S$47). It is a multipurpose stain that works with your chemistry for a pink shade. The colour develops according to your skin's acid level, which can vary according to to your mood or temperature. d. Amazing Base Loose Powder (Retail Price- S$79). It is a mineral foundation that provides weightless coverage. It is available in 17 shades. 5. Neutrogena Hydro Boost Water Gel, 5g (Retail Price- S$20.90 for 50ml). This gel restores the skin's moisture level and provide hydration that lasts upto 12 hours. It has a non-greasy feel, a pleasant fragrance and does leave your skin feeling soft and supple. Value of sample- S$2.09. 6. AVANCE Dou Demaquillant SUPER, 10ml (Retail Price- S$28.90). It is a remover for resistant and water proof eye makeup. Which removes the make up as well as moisturizes the eye area. 7. CELLILUX Glacial Mineral Gel, 7g (Retail Price- S$78 for 60g). This face mask gel help to reverse damage to your skin and provides hydration for dull and dry skin. Can be used for all types of skin. More information can be obtained on www.cellilux.com. Value of Sample- S$9.10. 8. Herborist Whitening and Revitalizing Mask, 30g (Retail Price- S$26 for 100g). A gel based on Traditional Chinese Medicinal Formulation is a combination of natural and chemical formulation. It contains pearl powder and seven whitening herbs. It helps to fade dark spots and acne marks. Value of Sample- S$7.8. 9. VICHY NORMADERM Deep Cleansing Purifying Gel, 2pcx X 5ml (Retail Price- S$29 for 200ml). It is a facial cleansing gel for acne and spot prone skin. It also unclogs the pores, removes makeup and dirt build up for healthy skin. Value of Sample- S$1.45. 10. 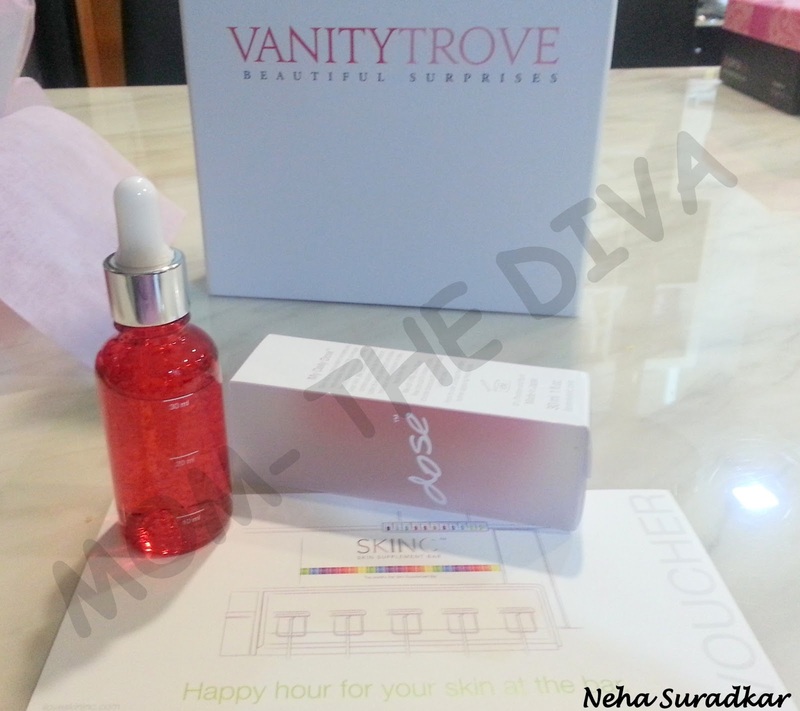 VICHY NORMADERM HYALUSPOT, 3ml (Retail Price- S$29.90 for 15ml). It is a spot and mark reduction gel that acts on bacteria and makes pimples disappear in 2 days. Value of sample- S$6. 11. VICHY NORMADERM Tri-activ anti-imperfection hydrating care, 3ml (Retail Price- S$39 for 50ml). This moisturizer acts against skin imperfection and oil control, leaving a long lasting matte finish. Value of Smaple- S$2.34. You may also like register with Vanity Trove, fill your beauty profile, and interact with others and see what they love and are using. The platform is like a facebook for beauty. You may also like to follow me here to know about my favorite products, my wishlist and also product reviews... See you there!